From our original 8-pitch housing to the industries best no thread connectors; we have a high voltage (HV) connector that will fit your needs. All TJB HV couplers feature a durable aluminum housing with a solid polyester insulator plate and your choice of EP rubber or 100% virgin molded PTFE insulating tubes. 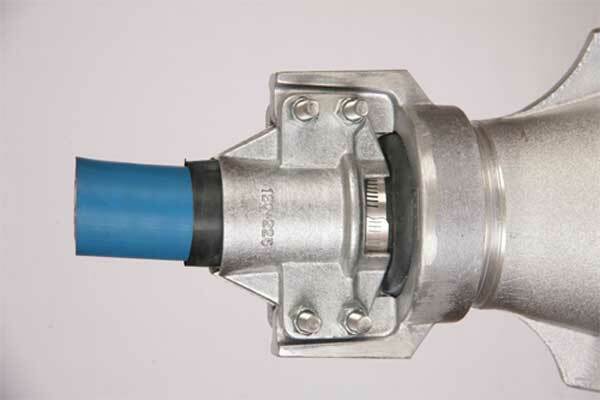 Our unique cable entrance allows TJB couplers to meet IP 67 standards for dust and water exclusion even when the cable is out of round or under sized. With contacts tested to 800A DC and able to accommodate conductor sizes as small as #10 and as large as 500MCM with a cable diameter of 3.75” means no matter what your use case is, our HV couplers will fit your needs. 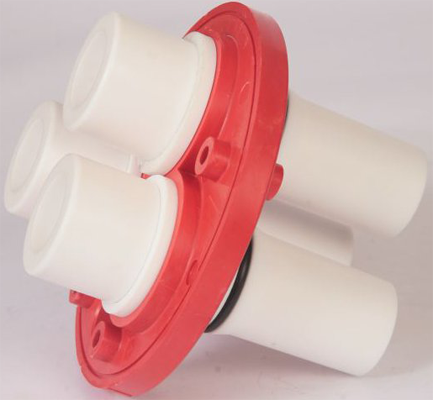 Why Pay More for PTFE? NONSTICK means coupler cleaning requires little more than a damp cloth. INERT there are very few chemicals that can react with or damage PTFE, so acidic mine environments do not decrease coupler life. HYDROPHOBIC PTFE does not absorb water like rubber so dielectric strength is not compromised in damp environments. RIGIDITY the stiffness of PTFE requires less cable training to maintain contact alignment during installation. NO TRACKING tracking is caused by the slow breakdown of an insulator due to high voltage exposure; while you may see a black path form on PTFE insulators, from arcing on dirt, the black path is NON-conductive and simple cleaning will bring the insulator back to 100% usability. NO-THREAD- Since TJB introduced the first no-thread couplers they have grown in popularity and are the most frequently ordered closure type. 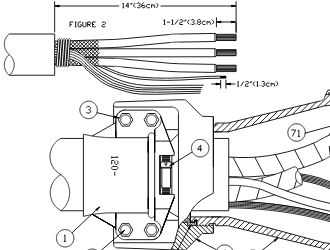 The no-thread connectors have become so popular because they solve almost all the issues associated with other closure types. No-thread couplers use a pin and slot design that goes from open to closed in as little as 90 degrees. Detents at the end of the slot provide a positive indication of coupler closure and also prevent decoupling due to vibration. Unlike conventional threads the TJB no-thread design is self-cleaning, avoiding the prolonged downtime and damaged parts resulting from jammed threads. Kits to convert TJB and NON-TJB couplers to no-thread are available and take only a few minutes to install. 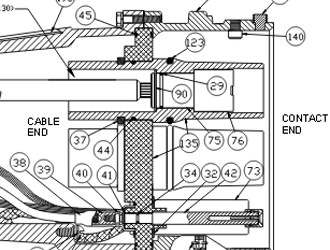 4-PITCH 4-Pitch is the best option when a threaded coupler is required, with a blunt start and a double thread design, TJB 4-pitch couplers virtually eliminate the possibility of cross threading and thread roll over while also decreasing the number of turns required to mate the couplers. All TJB HV couplers come with a ball bearing mounted floating nut. 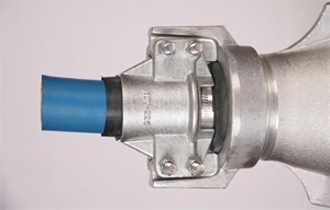 The ball bearings reduce the intrinsic drag and provide a longer wear life in frequently coupled connectors. 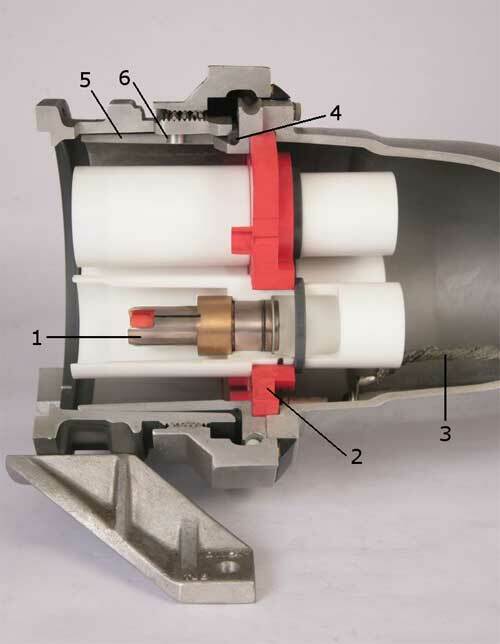 The floating nut also allows for the plug to be inserted into the socket before the threads are engaged enabling faster connections and decreasing the likelihood of insulator damage. 8-PITCH- 8-Pitch is only recommended to legacy operations where conversion to 4-pitch or no-thread is not an option. 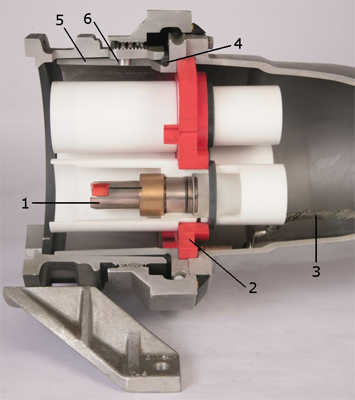 While not an ideal connection type TJB has taken several steps to reduce the problems that can occur with 8-pitch couplers. The plug nuts on 8-pitch couplers are fitted with a stainless steel thread to prevent galling, and as with the 4-pitch a blunt start thread provides cross threading protection and creates a more durable first thread. TJB phase and ground contacts are made of solid copper and silver plated to resist corrosion. 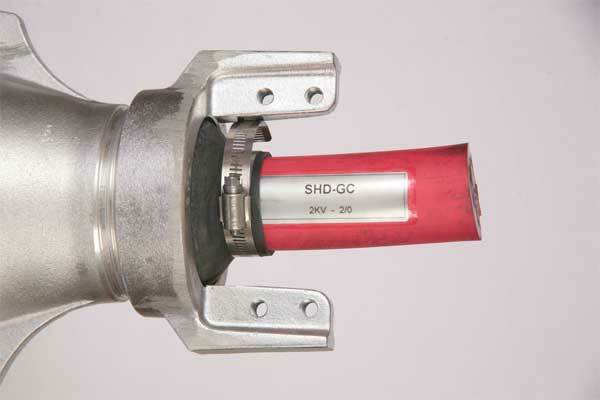 Male contacts have split noses and contain a silicone button that expands when heated, ensuring high contact pressure under heavy loads without increasing the force required to connect and disconnect the couplers. Solid polyester insulating plate allows for a double O-ring seal to eliminate water seepage and increase the stability of the ground and ground check contacts. 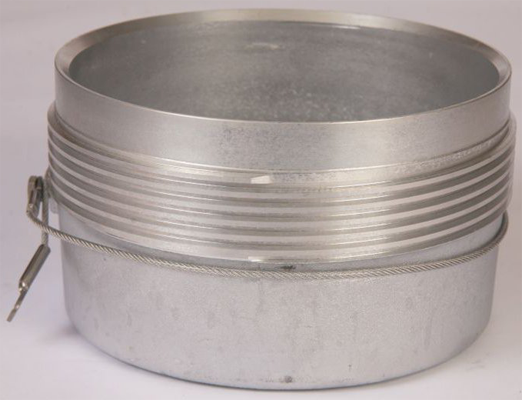 Aluminum housing is grounded internally with a tinned copper braid to guarantee high conductivity and provide greater flexibility reducing installation effort. A beveled edge on the plug cover and socket body mate to create a dust and water tight seal independent of the threads, precluding leakage as the threads age and wear. Overlapping metal housings allow for coupler engagement by hand with no special tools and no risk of damage. 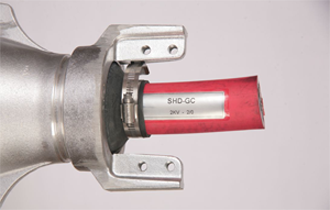 It also allows couplers to be more compact and provides shielding to the user during coupling and uncoupling. A pin on the female housing aligns with a slot on the male housing preventing out of phase connections and providing rotational alignment. A cone shaped rubber molding is placed over the opening of the end-bell with an end casting acting as a bead lock to maintain the seal. 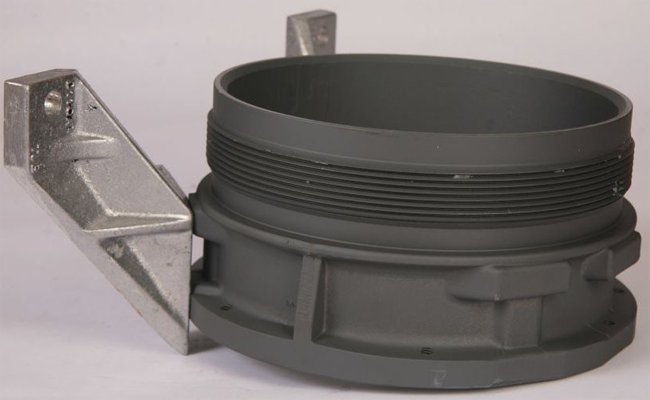 The point of the cone is molded or trimmed to fit the specified cable size. 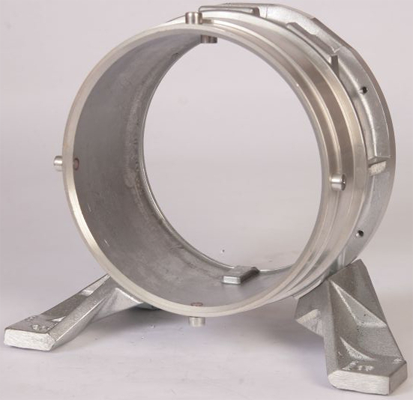 The elasticity of the material is enough to prevent water and dust intrusion but an additional hose clamp is provided to to increase the seal pressure. The advantage of this method is that it allows for a tight seal on out of spec, out of round, and even flat cable. Stress relief is provided by two solid aluminum clamps sized for your cable and bolted to the end casting. The clamps deliver evenly distributed pressure on the circumference of the cable and flared ends on the cable side of the clamp remove the possibility of damage from pressure points on untrained cable. Standard couplers include: one ground check, dust cover, threaded phase contacts, ground contacts and shield terminating materials where applicable. 5 - Large end bell for cable over 3"
5A - Large bell for cable under 3"
5B - Large bell w/extension for cable over 3"
5C - Large bell w/extension for cable under 3"